Are you worried about your child, family member or friend? This site has been designed by young people, is primarily for young people. If you are a parent, carer or family member looking for support for your child/young person or for yourself please go to the Find Support page. Young Minds is a national organisation, their website has lots of information and advice and they offer a parent helpline. Cornwall Early Help Hub is the single point of contact for access to community-based health and social care services for children and young people. You can contact the team for advice on 01872 322277 – the Hub is open Monday to Thursday, 8.45am to 5.15pm and 8.45am to 4.45pm on Fridays. From the website you can download referral forms for Child and Adolescent Mental Health Services (CAMHS), youth and family support, learning disability service and the Autistic Spectrum team among others. The Cornwall Family Information Service includes a directory of services for parents, carers, children and young people locally. Parenting support programmes are provided around the county every year, details can be found on the Cornwall Council website. B-eat is a national charity supporting people with eating disorders and their families, the site has a lot of information for family and carers and the organisation operate a help and advice line. MindEd is a free educational resource on children and young people’s mental health with accessible online learning, they have recently developed a programme designed for families. If you are worried about a friend and want tips on offering support and guidance try Epic Friends – this is a great site with lots of information for young people. The Mix is another great site – aimed at a slightly older age group. It has information about lots of issues relevant to young people and includes videos, apps, message boards and 121 chat online. 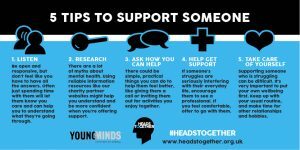 If you are a young person caring for a parent, carer, sibling, partner or other family member with a mental illness you may need some support yourself. Kernow Young Carers supports children and young people up to 18 years and offers support, information and guidance, activities and trips, short breaks and school groups. Rethink also offers information and advice for young carers.